I had just finished shooting sunset on top of the Continental Divide and was on my way back down Flattop Mountain. The sun had set about 15 minutes ago but as I looked out to the south I noticed Longs Peak coated in ice and glowing from the remaining light in the sky. 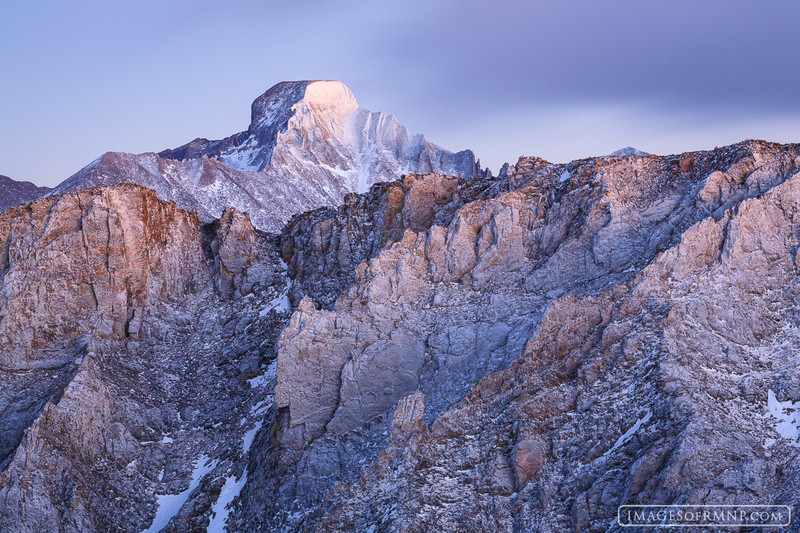 In front of it stood the jagged ice covered rocks of the eastern side of Hallett Peak. Large clouds would come in and swallow Longs Peak and then the mountain would appear again. This happened over and over again. This image was taken just as the clouds moved in again, preparing to cover the peak. Photo © copyright by Erik Stensland.